Are you a fishing enthusiast? Madeira Beach is known as the Grouper Capital of the world. The guys (and girls too!) Can enjoy a deep sea fishing excursion on one of their many days here for your Madeira Beach Wedding. Keep your guests entertained at John’s Pass Village and Boardwalk, a large outdoor shopping and dining experience like no other. Enjoy over 100 unique shops and local bars, many with beautiful views of the ocean and sunset. Madeira Beach Weddings are ideal for any type of crowd! Madeira Beach is still a mostly residential area, making the beaches less populated for your beach wedding ceremony. Madeira Beach is located on the waterfront at St. John’s Pass. It is located in Pinellas County, and is ranked the #1 tourist attraction in the large county. Get the beautiful views of the turquoise waters, vibrant sunsets, island atmosphere, and more during your Madeira Beach Wedding. 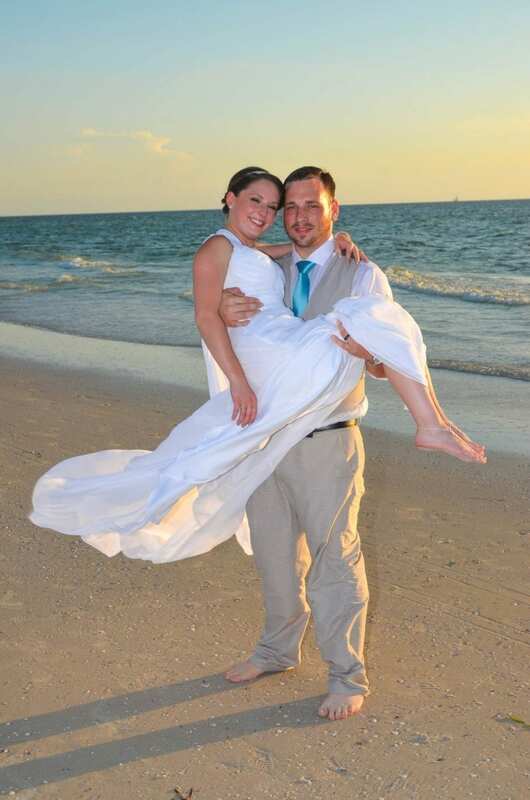 When you choose Your Florida Beach Wedding Company, you will find that you will receive excellent customer service, as well as a professional staff who will set-up, and coordinate your Madeira Beach Wedding Location. Whether we provide the ideal location, or you have a beach area of your own in mind, we can make your destination beach wedding ceremony beautiful, and unique. With many packages to choose from, you are sure to find the right Florida beach wedding package that will work for your guest count, and your decor wishes. Your Madeira Beach Wedding experience will leave guests bragging about the beautiful city you choose for your elegant and unforgettable beach wedding. With endless opportunities to keep you and your guests busy and entertained, Madeira Beach Weddings in Florida are an excellent choice. If you are ready to start planning your destination Madeira Beach Wedding Ceremony, check out our beach wedding packages here.